S'mores and suppers near a fire fill out the Santa Barbara spot's cozy offerings. 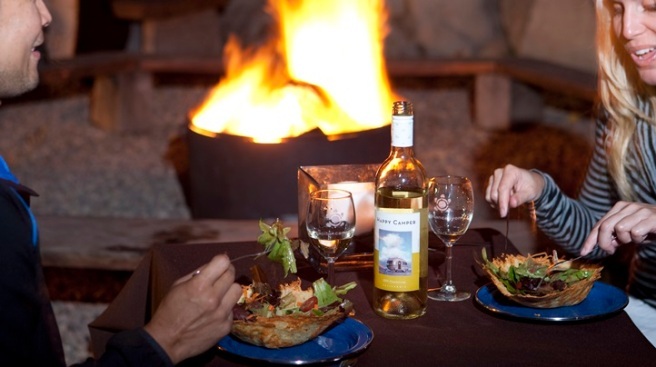 El Capitan Canyon's fall packages include outside dinners near a toasty fire pit. It's Santa Barbara living with a strong side of rustic. INCREASING USE OF "CABIN": If there's a season when people start to say the word "cabin" more often, we'll wager it is fall. Something about the air turning a tad brisker, and the holiday decorations appearing on shelves, have us pondering greeting-card-y settings in the woods, where we might read paperbacks and do puzzles and poke at embers and become sticky with s'mores. Retreating to a cabin is, in fact, a rite of fall and winter, but because we're in California, we're off the hook when it comes to locating a cabin that has a roof laden with snow. We can, in fact, find a cabin, or hefty tent, nearer to the beach, which feels very West (tm) and very Golden State and very right for autumn near the Pacific Ocean. El Capitan Canyon near Santa Barbara fits that bucolic-meets-ocean-waves bill, but there's a streak of posh-properness to an overnight stay there, too. "Glamping" is often the word used for the property's nicely outfitted tents and cabins, and if you want to use it, you can. Us? We prefer saying the word "s'mores" over and over, as the gooey dessert is part of the property's Fireside Dinner Package. THAT PACKAGE... is indeed all about dining near an outside fire pit, and it includes a s'mores kit and a barbecue dinner kit (it arrives on "the guests' doorstep with pre-marinated meat, side dishes, beverages, tableware, and the grilling tools and firewood needed to cook over a fire pit"). Oh yeah, this feels fall-y, and you can book it any night of the week, starting at $245 (weekends'll require a two-night minimum, though). When's it available through? Just a pinch before Thanksgiving, meaning you'll have to enjoy this one in the autumn (a good thing). Interested in other packages around the creek-close property? The Autumn Sunrise Special and the Rustic Relaxation Package are also in the air. However you slice it -- or smoosh it, s'mores-style -- you'll get some nature, some cabin/tent time, some brisk air, and a chance to decompress prior to compressing over the holidays.